Whether a result of injury, infection, sickness or a medical condition, chronic pain can be a reality in which countless people live their lives on a daily basis. For the person suffering with chronic pain, even the simplest tasks can become a challenge to complete, causing an individual to feel handicapped in some regards. Because there is not always an effective treatment for the root cause of chronic pain, or the root of the problem is perhaps unknown, treatment can be more about symptom management. This often involves conventional and medical forms of treatment, such as the use of prescription pain medications, surgery, and more. Some individuals who are suffering with chronic pain may prefer to look at alternative forms of treatment and pain management to help minimize the potential risks and side effects. Thankfully, a variety of alternative treatment options exist that may be helpful in managing or reducing pain. Meditation, or the practice of mindfulness, is the state of awareness of one’s own experiences without any pretense or judgments. Because pain evokes such a strong emotional reaction, a host of other mental illnesses and disorders can also arise or develop alongside chronic pain. For example, an individual suffering with chronic pain may also develop an anxiety disorder about their circumstances or inability to care for themselves. Other individuals may struggle with depression or a mood disorder if chronic pain has altered their lifestyle and prevented them from engaging in activities that they once enjoyed or found pleasurable. While the act of meditation cannot in itself cannot “cure” chronic pain, it may help individuals better cope with and manage chronic pain. While conventional treatment methods, such as prescription pain medication may help a person cope with the experience of pain symptoms, conventional treatment can only go so far in addressing the other factors that are often involved with chronic pain. A person suffering with chronic pain is likely also coping with environmental stress, societal concerns, relationship issues, and more than just the physical symptoms of chronic pain. 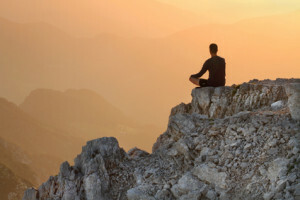 Meditation techniques can help a person reduce stress and tension through visualization and relaxation methods that may ease the nervous-system reaction that triggers pain. 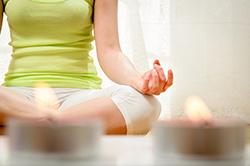 Many healthcare practitioners may utilize or practice meditation, mindfulness, or relaxation techniques through their therapeutic approach for the treatment of chronic pain. 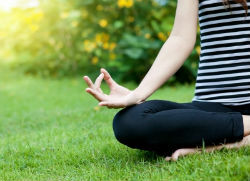 Some forms of exercise, such as yoga or tai chi, may also emphasize meditation and mindfulness as part of the practice. If you or a loved one has been struggling with chronic pain and has found little to no relief through conventional forms of treatment, you may consider exploring how alternative health care forms may help you effectively manage or decrease the symptoms you may be experiencing. It is important to talk with your healthcare provider about what forms of alternative therapy may be most appropriate and effective for you and to collaboratively discuss what an effective care plan may be for pain management. Suffering with chronic pain can be challenging in many aspects – including physically, emotionally, mentally, and spiritually. Incorporating alternative forms of therapy may be helpful in restoring body-mind function, promoting balance, and making life with chronic pain much more manageable. The practice of meditation is one form of alternative treatment that can be effective in reducing stress, relieving tension, increasing awareness, and promoting a greater appreciation of you body and mind. Know that there is hope for you to thrive in life once more, even with the struggle of chronic addiction. Have you ever integrated meditation as a supplement to medical treatment of chronic pain? If so, how was this helpful to your treatment and management of pain? What encouragement might you share with others who are considering integrating meditation into their daily lives?